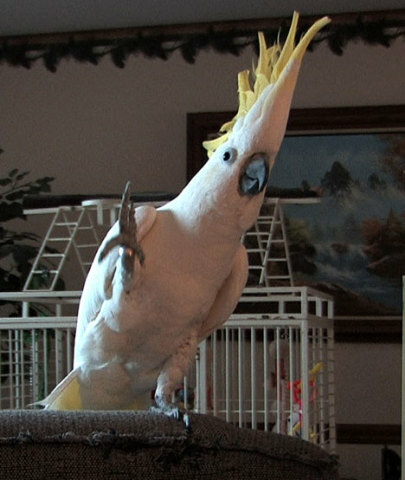 You may have seen one of Snowball's YouTube videos, or seen the sulpher-crested cockatoo on the David Letterman show. He's made a hit on all the talk shows, and he's even made a television commercial for a European bottled water. Snowball is a dancing bird. He keeps time with his head and he dances with his legs and claws. He's precious, and it's really hard to watch him with any degree of objectivity. So I don't know how Aniruddh D. Patel, of the Neurosciences Institute and the University of California, San Diego, was able to watch Snowball's videos over and over again, in order to study the bird's movements in relation to the music he was hearing. But never mind that. The point is that Snowball is not just famous as an entertainment artist now; he seems to have disproved a theory that only humans possess the capacity to synchronize their movements to music. Because this ability, beat perception and synchronization (BPS), had not been observed in other animals, it was considered a uniquely human ability and attributed to evolution. Using sophisticated synchronicity equipment with graphic outputs, Patel and his research team were able to determine that Snowball did possess BPS, albeit less sophisticated than an adult human, but at about the level of a toddler, who mostly gets the rhythm, but may wander off a bit at times. In an earlier study (2006) Patel had postulated that synchronicity is developed by auditory means, and does not come from an evolutionary acquired "musical gift." He demonstrated that the ability to re-create a sound that is heard is necessary for one to develop musical rhythm for dance. Several birds, including parrots, have that ability, as do dolphins; however, other mammals do not. Patel and his colleagues published their Snowball findings in a paper entitled Investigating the human-specificity of synchronization to music. Create App To Show Driver’s MPG & Win $25,000 In Ford Personalized Fuel-Efficiency App Challenge!